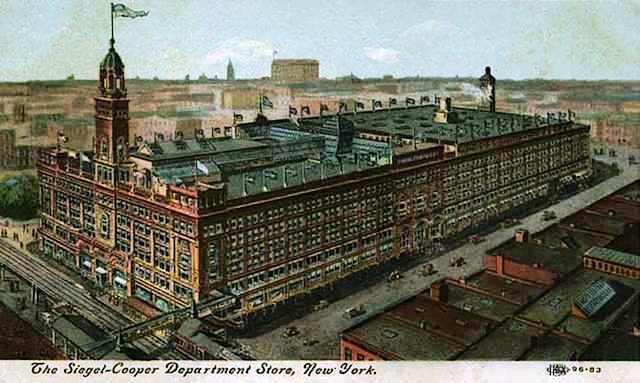 In 1902 the massive Siegel-Cooper Department Store on Sixth Avenue laid plans for a new warehouse nearby. The store was just seven years old and had been leasing a combined store-warehouse building at Nos. 214-216 West 17th Street—a structure erected especially for Siegel-Cooper. But by now that facility was no longer sufficient for the store’s extensive stable of horses, delivery wagons, and large stocks of goods. A postcard captured the scope of the 85,560 square foot store. By the time of the structure’s completion the five stories had grown to seven. Matching facades on 17th and 18th Streets were understandably understated as compared with the Sixth Avenue store. Yet the utilitarian structure boasted its own architectural flair. The tripartite design was defined by two thick bandcourses. Red brick rusticated piers that rose the height of the building along with segmental arched openings at the fifth floor comprised the sparse ornamentation of the upper floors. For the first two floors, however, the architects used lusty terra cotta ornaments to distinguish the façade. Each pier culminated with winged orbs bearing a sash emblazoned with SC&Co; and the bay doors were flanked by large, intricate wreaths. These, most likely, originally framed the supports of decorative lamps. Terra cotta keystones over the bays included the firm’s entwined monogram. Directly above, brick pilasters with prim terra cotta capitals supported a metal entablature that announced the store’s name. The intricate terra cotta wreaths most likely served as frames for lamp brackets. But the same year that The Spectator made the comment Henry Siegel was in trouble. The man who had been called “the Napoleon of the Department Store industry” had overextended himself. The Chicago-based businessman sold the New York operation to Joseph B. Greenhut for $500,000. Greenhut later reported that Siegel wept during the transaction. Greenhut’s purchase of the department store came at an ill-advised time. Already the grand emporiums of what was known as the Ladies’ Mile were abandoning Sixth Avenue, following Roland Macy’s lead. In 1902 he had shocked New York by moving Macy's department store ten blocks north of the shopping district, to 34th Street and Broadway. Nevertheless, Greenhut pushed on, confident that the Sixth Avenue shopping district would rebound. His optimism was soon dashed. By 1913 the expansive 17th Street warehouse was no longer used for storage of goods; but had been converted to the Greenhut store’s cabinet-making shop. For at least two years 20 men worked on custom furniture here. In 1915 the Greenhut operation failed. On December 4 that year The New York Times reported that Gimbel Brothers, located on Greeley Square just south of Macy’s, had leased the “former Siegel-Cooper warehouse” for $25,000 a year. The building would be sold and resold over the next decades. In 1949 Saxon Paper Products was still here, sharing space with the Sinco Shoe Stores. The old warehouse building received a startling internal make-over in 1983 when Benny Zucker took over 10,000 square feet for his silk flower business. Zucker’s family had been importing artificial flowers from China for generations. He hired a team to transform the space—two merchandising consultants, two architects, an illustrator, a lighting and an audio specialist. The result was a gigantic showroom for handmade flowers—mostly of silk—featuring dramatic lighting, artistic tableaux, and the sounds of ducks, crickets, birds and waterfalls. Customers purchased the items by the stem—ranging from 50 cents apiece to $5,000 for a fake tree. The flower showroom made way for Barneys warehouse at the turn of the century. Here the luxury retailer offered customers discounted merchandise for more than a decade. On February 20, 2001 Times columnist Monte Williams commented on the undisguised pipes and wires, as well as the demeanor of the warehouse sale patrons. The architectural firm Studios was commissioned to “reimagine” the buildings. The resultant renovation preserved the original hardwood floors and exposed 17-foot ceilings, and restored the masonry façade. Unlike so many vintage building make-overs that result in luxury housing; Savanna’s focus was on retail and office space. It worked. In 2013 the American home furnishings retailer Room & Board took 60,000 square feet for its flagship showroom; followed by Twitter which leased 140,000 square feet as its headquarters. Savanna sold the building in 2014 for $335 million. Except for the unfortunate loss of the cornice on both facades, and, of course, the sympathetic street level make-overs; little has changed to the 1902 Siegel-Cooper warehouse from which once teams of horses pulled package-filled drays to the homes of shoppers.